Is there a more beautiful prayer? Is there a more beautiful Saint? Is there a more beautiful Mother? Was there ever a woman more honored by God? totally given to His infinite love. Lord Jesus Christ, Son of God, Have mercy on my, a sinner. Virgin Immaculate, perfect lover of Our Lord in the Blessed Sacrament, we ask thee to obtain for us the graces we need to become true adorers of our Eucharistic God. 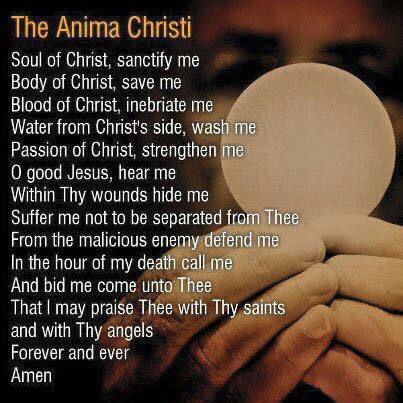 Grant us, we beg of thee, to know Him better, to love Him more, and to center our lives around the Eucharist, that is, to make our whole life a constant prayer of adoration, thanksgiving, reparation, and petition to Our Lord in the Blessed Sacrament. Amen. In the name of the Father † and of the Son, and of the Holy Spirit. Amen. Pour forth, we beseech You, O Lord, Your Grace into our hearts; that we to whom the incarnation of Christ, your Son was made known by the message of an angel, may by His passion and cross be brought to the glory of His Resurrection. Through the same Christ, our Lord. Amen. Heavenly Father, I love You, I praise You, and I worship You. I thank You for sending Your Son Jesus Who won victory over sin and death for my salvation. I thank You for sending Your Holy Spirit Who empowers me, guides me, and leads me into fullness of life. I thank you for Mary, my. 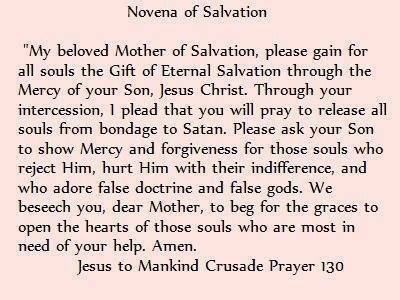 Heavenly Mother, who intercedes with the holy angels and saints for me. we may be more efficacious in extending the reign of Christ in our days. Most holy Apostle, St. Jude, faithful servant and friend of Jesus, the Church honors and invokes you universally, as the patron of difficult cases, of things almost despaired of. Pray for me, I am so helpless and alone. Intercede with God for me that He bring visible and speedy help where help is almost despaired of. 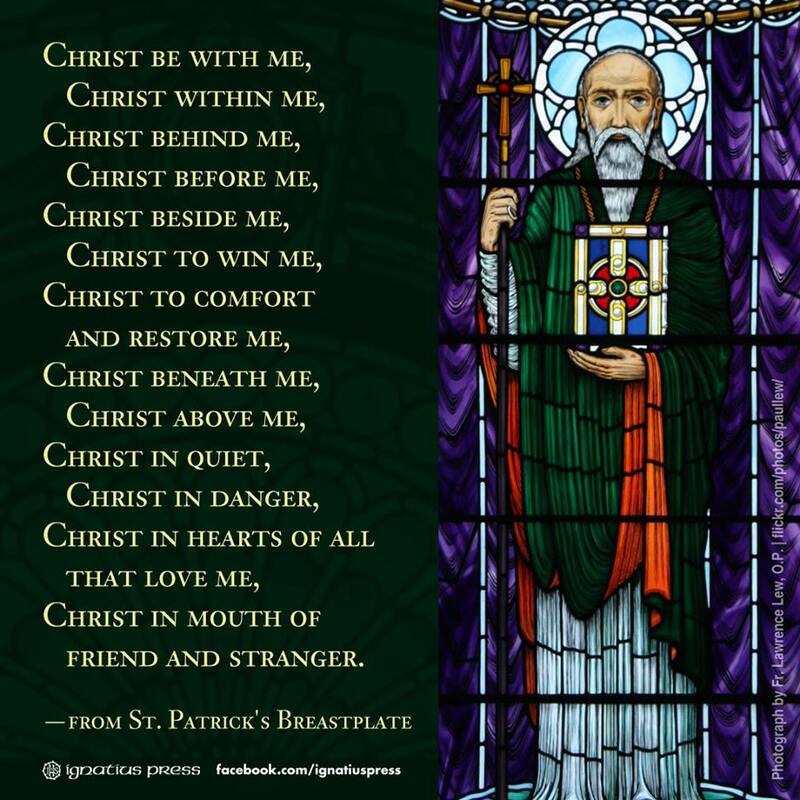 Come to my assistance in this great need that I may receive the consolation and help of heaven in all my necessities, tribulations, and sufferings, particularly …(make your request here) …and that I may praise God with you and all the saints forever. I promise, O Blessed St. Jude, to be ever mindful of this great favor granted me by God and to always honor you as my special and powerful patron, and to gratefully encourage devotion to you. 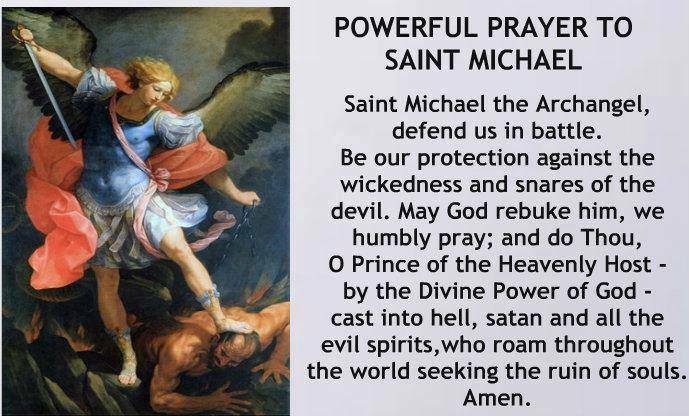 Saint Michael the Archangel,defend us in battle. May God rebuke him, we humbly pray;and do Thou, O Prince of the Heavenly Host –by the Divine Power of God –cast into hell, Satan and all the evil spirits,who roam throughout the world seeking the ruin of souls. Amen. Souls from Purgatory each time it is said. The prayer was later extended to include living sinners as well. Jesus, Mary and Joseph, may I breath forth my soul to you in peace. Amen. O St. Joseph, whose protection is so great, so strong, so prompt before the Throne of God, I place in you all my interests and desires. O St. Joseph, do assist me by your powerful intercession and obtain for me from your Divine Son all spiritual blessings through Jesus Christ, Our Lord; so that, having engaged here below your Heavenly power, I may offer my thanksgiving and homage to the most loving of fathers. O St. Joseph, I never weary contemplating you and Jesus asleep in your arms. I dare not approach while He reposes near your heart. Press Him in my name and kiss His fine Head for me, and ask Him to return the Kiss when I draw my dying breath. St. Joseph, Patron of departing souls, pray for us. Amen. Yet you never despaired or lost faith.